Financial securities: what's that all about? A financial security is an instrument to give a party (for instance, the buyer of a wind turbine foundation) an assurance that the seller (in this case, the company that build the foundation) will perform according to his obligation (that is, will comply with the technical and commercial requirements). They can have different names – the most usual are “Bonds” and “Guarantees”. The main difference between the 2 is that a bond is stronger – you can draw upon a bond simply asking the money to the bank, while with a guarantee you need to demonstrate that there is a breach of contract before getting the money. An additional problem with guarantees is that they are linked to the specific contract in place. Therefore changes to the contract (and changes during construction happen really often) could potentially invalidate the guarantee. 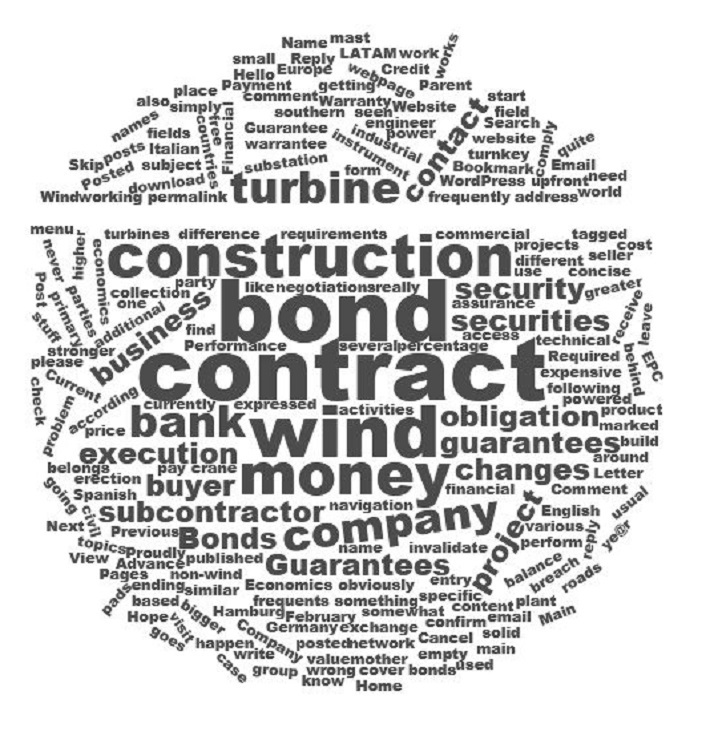 There are quite a few bonds / guarantees that are usually used in a wind farm construction contract. Advance Payment: the subcontractor receive money upfront to start the works, but he has to give a bond in exchange. Performance: this bond is draw upon if something goes wrong during the execution of the contract. Warranty: this will cover the obligation of the subcontractor after the execution of the project. There are other Guarantees frequently seen in the business – one is the Parent Company Guarantee, that you are going to ask if you are working with a small company that belongs to a greater industrial group with a more solid mother company and the other is the Letter of Credit, that you are normally asking to a bank to confirm that the buyer of your product (for instance, expensive wind turbines) will pay for it. Bonds, warranties and similar stuff are not free – you have to ask them to your bank and they will cost money, and obviously the bigger the bond the higher the price. Therefore the value of each security, normally expressed as a percentage of the contract, is usually subject of never ending discussions and negotiations between the parties.